Definition at line 515 of file llinventorybridge.h. Definition at line 531 of file llinventorybridge.h. References FALSE, LLInventoryItem::II_FLAGS_OBJECT_HAS_MULTIPLE_ITEMS, mAttachPt, mIsMultiObject, and TRUE. Definition at line 3279 of file llinventorybridge.cpp. References LLObservable::addListener(), LLMenuGL::append(), attach_label(), gAgent, LLAgent::getAvatarObject(), LLView::getChildCount(), LLMenuGL::getChildMenuByName(), LLInvFVBridge::getClipboardEntries(), LLItemBridge::getItem(), LLView::getListenerByName(), hideContextEntries(), LLInvFVBridge::isInTrash(), isItemRemovable(), LLVOAvatar::isWearingAttachment(), LLVOAvatar::mAttachmentPoints, LLInvFVBridge::mInventoryPanel, LLInvFVBridge::mUUID, NULL, sContextMenuItemID, and TRUE. Definition at line 3137 of file llinventorybridge.cpp. References LLAssetType::AT_OBJECT, get_item_icon(), mAttachPt, mInvType, and mIsMultiObject. Definition at line 3205 of file llinventorybridge.cpp. References LLFontGL::BOLD, gAgent, LLAgent::getAvatarObject(), LLVOAvatar::isWearingAttachment(), LLInvFVBridge::mUUID, and LLFontGL::NORMAL. Definition at line 3218 of file llinventorybridge.cpp. References gAgent, LLVOAvatar::getAttachedPointName(), LLAgent::getAvatarObject(), LLItemBridge::getLabelSuffix(), LLVOAvatar::isWearingAttachment(), LLInvFVBridge::mUUID, and LLStringBase< char >::toLower(). Definition at line 519 of file llinventorybridge.h. Definition at line 3129 of file llinventorybridge.cpp. References FALSE, gAgent, LLAgent::getAvatarObject(), LLInvFVBridge::isItemRemovable(), LLVOAvatar::isWearingAttachment(), and LLInvFVBridge::mUUID. 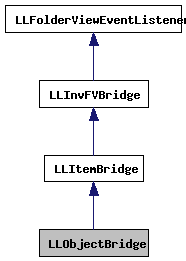 Definition at line 3197 of file llinventorybridge.cpp. Definition at line 3145 of file llinventorybridge.cpp. 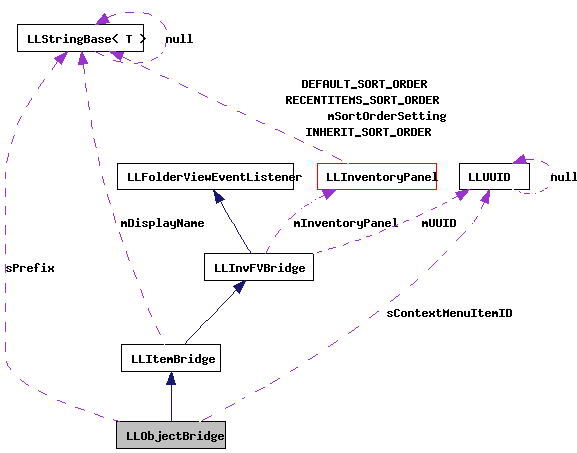 References _PREHASH_AgentID, _PREHASH_DetachAttachmentIntoInv, _PREHASH_ItemID, _PREHASH_ObjectData, LLMessageSystem::addUUIDFast(), copy_inventory_item(), LLViewerObjectList::findObject(), gAgent, LLViewerRegion::getHost(), LLAgent::getID(), LLAgent::getInventoryRootID(), LLInventoryModel::getItem(), LLPermissions::getOwner(), LLInventoryItem::getPermissions(), LLAgent::getRegion(), LLInventoryObject::getUUID(), gFocusMgr, gInventory, gMessageSystem, gObjectList, gSelectMgr, LLViewerInventoryItem::isComplete(), LLInventoryModel::isObjectDescendentOf(), llendl, llwarns, LLInvFVBridge::mUUID, LLMessageSystem::newMessageFast(), LLMessageSystem::nextBlockFast(), LLUUID::null, NULL, LLItemBridge::performAction(), LLSelectMgr::remove(), rez_attachment(), LLMessageSystem::sendReliable(), and LLFocusMgr::setKeyboardFocus(). Definition at line 3361 of file llinventorybridge.cpp. References LLSelectMgr::addAsIndividual(), LLItemBridge::buildDisplayName(), LLSelectMgr::deselectAll(), FALSE, gAgent, LLAgent::getAvatarObject(), LLItemBridge::getItem(), LLInventoryPanel::getModel(), LLInventoryObject::getName(), getPrefix(), LLInventoryObject::getUUID(), LLVOAvatar::getWornAttachment(), gSelectMgr, LLItemBridge::isItemRenameable(), LLItemBridge::mDisplayName, LLInvFVBridge::mInventoryPanel, LLInvFVBridge::mUUID, LLInventoryModel::notifyObservers(), LLPreview::rename(), SELECT_ALL_TES, LLSelectMgr::selectionSetObjectName(), and LLInventoryModel::updateItem(). Definition at line 517 of file llinventorybridge.h. Definition at line 543 of file llinventorybridge.h. Referenced by getIcon(), and LLObjectBridge(). Definition at line 542 of file llinventorybridge.h. Definition at line 544 of file llinventorybridge.h. Definition at line 541 of file llinventorybridge.h. Definition at line 540 of file llinventorybridge.h.